A lifestyle blog is a website where its author talks about the way of living. In general, lifestyle bloggers write about fashion, health & fitness, travel, etc. The blog posts are inspired by the author’s interests and experiences of daily life. 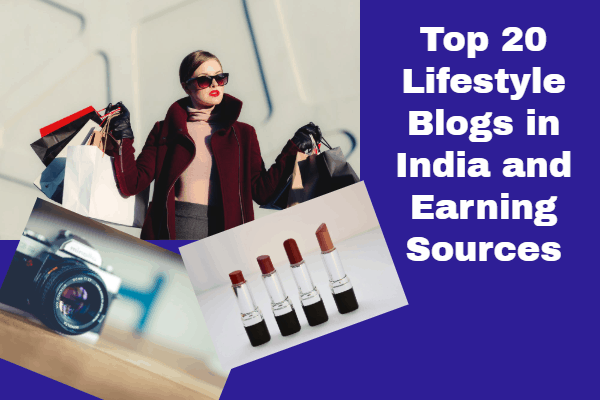 In this post, we will discuss the top 20 lifestyle blogs in India and their earning sources. All these blogs are being run by women and they have a special focus on fashion. Many people thought successful bloggers are only from technology niches. You can be a success in any niche of blogging and this statement has been proved by lifestyle bloggers in India. By knowing these lifestyle bloggers, you will understand their ways of earning money from blogs. It will inspire you to become a successful blogger. I have arranged these Indian lifestyle blogs in descending order of their Domain Authority. This blog is run by two women friends – Payal and Priyanka. One has a coding background, while the other has advertising and design. The two ladies started “High Heel Confidential” in 2007 to share their love for fashion. 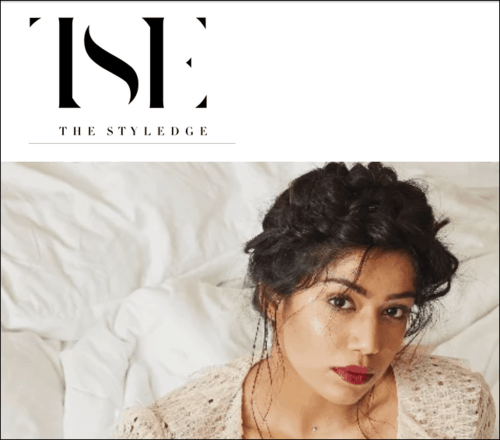 This lifestyle blog covers fashion and style of Indian celebrities across various fields including Bollywood. High Heel Confidential was the first Indian blog in its niche. It has been appreciated by Indian fashion magazines, like Vague India and Elle India. You can find below the massive social media presence of this website. 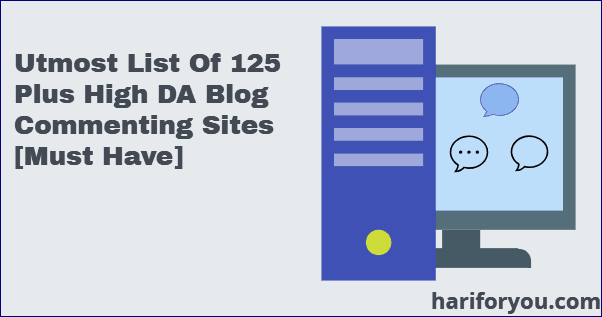 This factor has helped this blog to be the first among the top 20 lifestyle blogs in India. The monthly page views are 2+ millions as per the statement of this website. So, Google ads are contributing a lot to the blog’s monthly income. But the blog owners have not disclosed the monthly or annual revenue. The Verve magazine is available in digital form as well as in paper form. The print magazine was started by well-known industrialist Anand Mahindra’s wife Anuradha Mahindra in 1995. It was the first Indian magazine on women’s lifestyle. The digital form of Verve came into existence in April 2014. The luxury lifestyle blog covers a variety of topics ranging from arts & culture, fashion & beauty, to travel & spaces. Moreover, it talks about Indian as well as international fashion. Indian celebrities including film stars and sports people also feature on this lifestyle blog website. Verve Magazine has not revealed its revenue. But, as per information on the web, it has an estimated annual revenue of $5M. Naina Redhu is a luxury and lifestyle photographer, experienced collector and blogger since 2004. But she launched her lifestyle blog – Naina.co only in July 2010. Naina.co brings international brands of fashion and style to its Indian audience. In addition, the beautiful homepage shows photos of healthy foods, fashionable clothes, jewelry, skincare, hair-styles, travel destinations, etc. Naina Redhu travels a lot and shares her experiences and stunning photographs on this blog. She also releases podcasts regularly. Naina has big names like HTC, Nokia, Wills lifestyle, Adobe, etc., as her clients for her services on photography and online brand building. As per its media kit, Naina.co attracts 52K page views per month. But I did not notice any Google ad on this website. 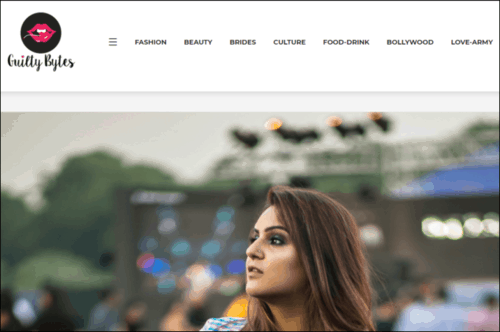 Being there for a long time in the industry and its brand collaboration with reputed companies put naina.co among the top lifestyle blogs in India. 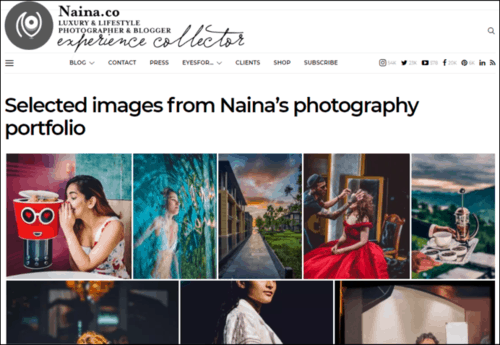 “Pick My Brain” – a 90-minute one-on-one session with Naina for consultation on photography, content marketing, and online branding. Selling her services on photography and online branding directly to big clients. Shalini Chopra, an Indian girl, felt that every person could be stylish and trendy in all aspects of life. And she wanted to share this thought and knowledge with the world. This led her to create a fashion and luxury lifestyle blog Stylish By Nature in Dec 2011. She is a famous blogger and has become a source of inspiration for many people. Her blog features many aspects of a lifestyle and they include fashion, food, travel, beauty, technology. She also offers shopping on this site. Shalini bagged the award for ‘Best Fashion Blogger – South’ in 2018. Moreover, her blog ranked on the top of fashion blogs in 2014, 2015, and 2016. Stylish By Nature also figured in many national and international magazines. Look at the Instagram following of this blog! Wow 411K. It is one of the reasons that put this blog in the top 20 lifestyle blogs in India. 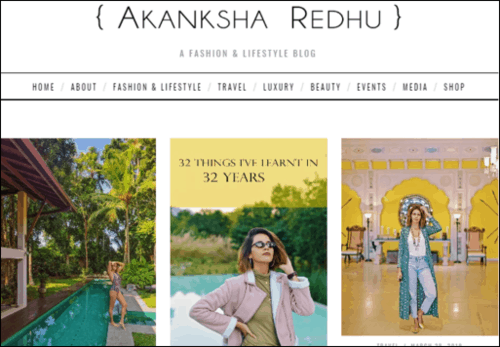 A desire to express her ideas on fashion and lifestyle prompted Akanksha Redhu to create a lifestyle blog akanksharedhu.com in 2010. This woman blogger is from Delhi, India and holds a degree in Fashion Designing. Moreover, her blog shares articles on fashion, beauty, lifestyle, travel, events, and social media. She has traveled extensively in India and abroad and shared her experiences on akanksharedhu.com. Under the beauty tips category, she is recommending only those products which have been used and tested by her. The blog has appeared in many newspapers and magazines. Some of the prominent names are – The Hindu, Times Life, Brides Today, Outlook Traveller, Vogue India, and Cosmopolitan India. Consistent impressive work of Akanksha has taken this blog to a group of the best lifestyle blogs in India. Like other bloggers of her niche, Akanksha has not shared her income. But, after analyzing this blog, we can find her revenue sources. Devina Malhotra is the owner of Guilty Bytes blog. She was a social media lover and wanted to share her knowledge of lifestyle, fashion, and beauty. So, she started this blog in 2012. This girl is from Delhi, India. 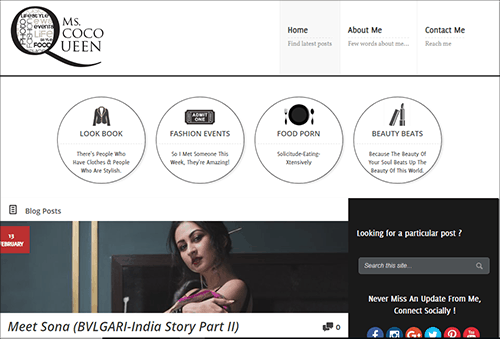 The blog focuses on lifestyle along with Indian women fashion and beauty. Her mother is quite good at cooking and takes care of food recipe section of the blog. Devina has also covered Bollywood celebrities’ fashion and gossip. This blog is famous and has figured in leading newspapers like The Hindustan Times, The Times of India, etc. As per the “About” section, this blog has over 20K monthly page views. 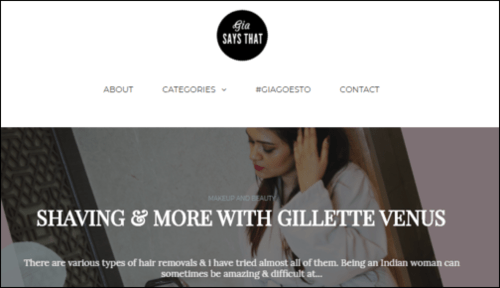 Gia Kashyap is the girl who started giasaysthat.com blog in 2010. She is from Mumbai, India and was still studying in college when her blog came into existence. She always wanted to share her ideas through images and words. This prompted her to start giasaysthat.com. Prior to this blog, Gia worked as a graphic designer and fashion columnist for a famous Indian publication. In her blog, she covers a number of categories. They include fashion, beauty, photography, lifestyle, travel, reviews, career, and videos. Like most of the other fashion and lifestyle bloggers, she promotes only those products which she was using herself. Aayushi Bangur is a lifestyle blogger from Mumbai, India. She was studying in college in 2010 when she started her blog – STYLDRV. It happened because she had a great passion for fashion and wanted to express herself to the world. In this blog, she writes about lifestyle, fashion, travel, and beauty. Moreover, she tries to bring out the newest fashion to the world. 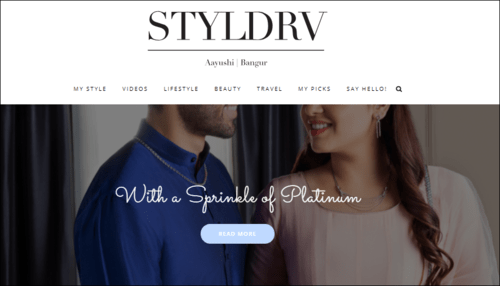 STYLDRV is a famous blog and has appeared on some high-ranking websites like – Indiatvnews.com and scoopwhoop.com. Santoshi Shetty, a lifestyle blogger from Chennai, started this blog in 2015. She has been an architecture student and enjoyed playing with colors, trends, patterns, and textures. Thesledge.com focuses on topics related to lifestyle, fashion, beauty, and travel. She has received many awards due to her blog. Some of them are – Elle blogger of the year 2016, Cosmopolitan blogger of the year 2016, and Palladium Spotlight blogger of the year 2017. Santosh Shetty has not revealed her sources of income. But I am sure she must be tapping the same sources as utilized by fellow bloggers. Rashmi and Jyoti are the two women who co-founded this lifestyle blog – Beauty & Fashion Freaks in 2013. While Rashmi lives in Pune, Jyoti stays in Delhi. 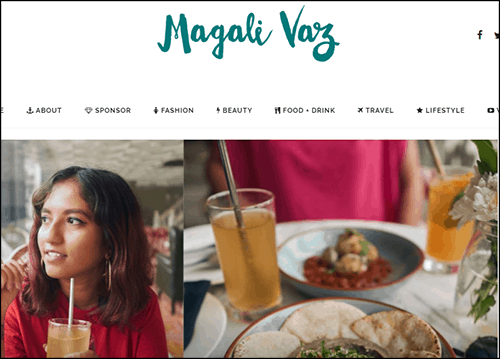 Like other lifestyle blogs in India, this blog is also covering topics from fashion, lifestyle, beauty, food, travel, and others. It is covering Hollywood as well as Bollywood fashion. So, there is no dearth of film star fashion pictures. Magali started magalic.com in 2009 when she was just 16 years old. She was born and brought up in Mumbai. She covers many aspects of a lifestyle like fashion, beauty, travel, food, style, etc. Moreover, Magali regularly creates videos and shares on her YouTube channel. This blog has a strong readership in India, USA, UK, Singapore, and Thailand. Magali promotes and supports only those brands which she believes and follows. She was featured in popular publications like Cosmopolitan, Hindustan Times, Grazia, etc. Moreover, she had been the official blogger for the city of Lavasa in 2012. 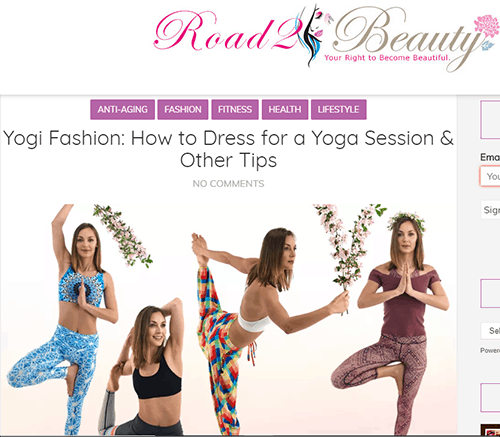 Anshulika Chawla, a freelance writer, started road2beauty.com in 2013. It was because she wanted to share her experiences and adventures with different beauty products. She studied journalism and mass communication along with English literature. Afterward, she worked as a writer and journalist in Mumbai. She left her corporate job and came into full time blogging business. Currently, Anshulika lives in Ludhiana, Punjab. Her lifestyle blog publishes posts related to fashion, travel, beauty, fitness and health, technology, etc. Along with Anshulika, her husband Manish Mehna is the co-founder and manager of this blog. Masoom Minawala is the owner of this blog. She loves fashion & style and expressing it in words gives her great pleasure. This Mumbai girl got a strong desire for owning a blog and hence founded Miss Style Fiesta blog in 2010. 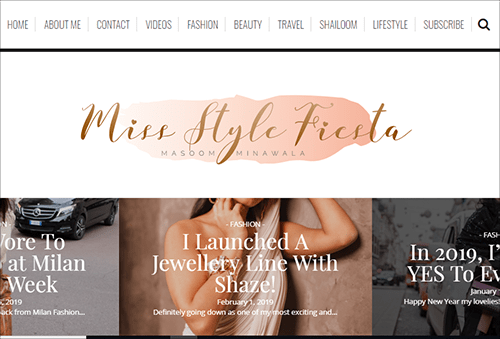 Missstylefiesta.com is a lifestyle blog that focuses on fashion, beauty, style, travel, and product reviews. 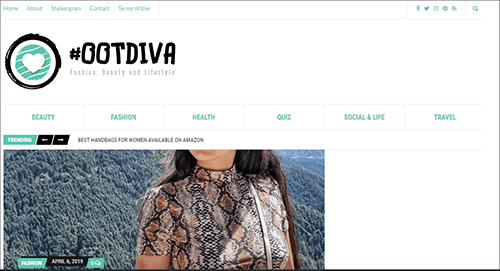 Ootdiva stands for “Outfit of the Diva” and this blog owner is Purnima Madaan. She wanted to share her views on style and fashion with people. This desire prompted her to start ootdiva.com in 2017. Purnima is from Delhi, India and has completed her B. Tech. Moreover, she is a professional content writer and a trained makeup artist. Ootdiva.com is a fashion and lifestyle blog that covers various aspects of a lifestyle. They include beauty, fashion, health and fitness, and travel. Owner of blahandmore.com, Rashi Gaur started this blog in 2012. She is a post graduate in fashion technology and stays in Delhi. Moreover, she has worked as a content manager in the corporate world. 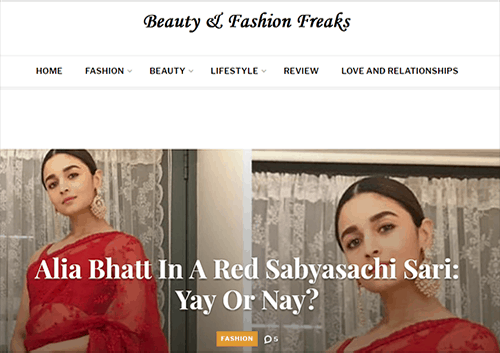 Rashi writes regular posts on beauty and fashion. 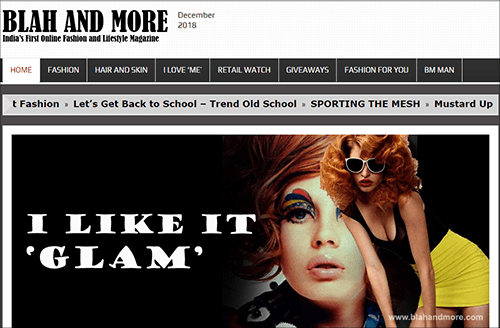 This lifestyle blog has appeared on the pages of Cosmopolitan India. It has also been talked about on some popular websites like desihome.com, socialsamosa.com, naina.co, etc. This blog has won Cosmopolitan blog awards 2013. Sukhneet Wadhwa launched this blog in 2013. She is a content writer, photographer and stylist. Sukhneet has worked with Vogue as a stylist. She belongs to Delhi. Her blog covers topics on lifestyle, fashion, beauty, food, giveaways, and travel. Niharika Verma founded this blog in 2016. She is from Delhi. 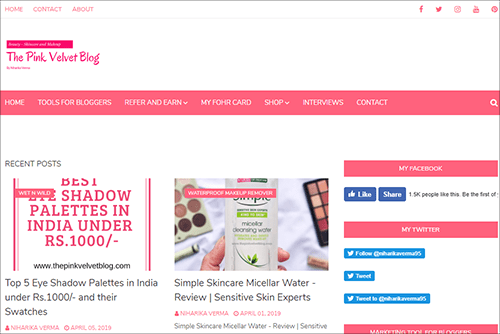 In this lifestyle blog, you can find beauty product reviews, and tips on health, skincare, and makeup. The Pink Velvet Blog caters the beauty, fashion and health needs of boys, girls, men, and women. All reviews on this blog are honest and unbiased. So, you can trust this blog contents. 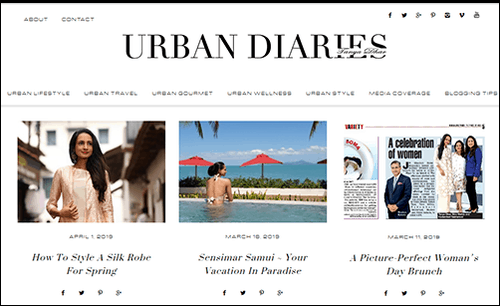 Tanya Dhar started this luxury lifestyle blog – urbandiaries.in in 2016. She belongs to Bangaluru, India. As the name suggests, the blog talks about urban lifestyle, fashion, and style. The blog features celebrity interviews, beauty products, travel experiences, and blogging tips. Tanya Dhar was featured in Bangalore Times, Bangaluru Chronicle, and Exhibit Magazine. She has worked with many famous brands. Some of them include Thailand Tourism, Hilton Hotels Worldwide, Bangalore Fashion Week. 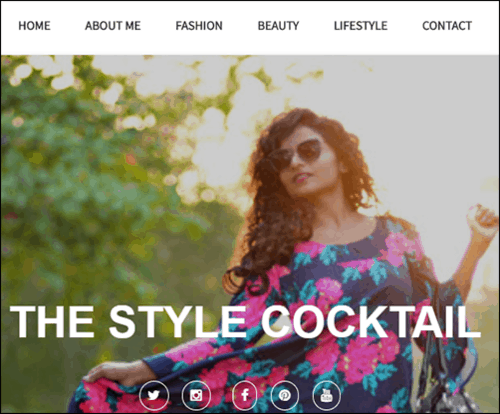 Saily Paitre, a girl from Mumbai, India, founded the lifestyle blog – thestylecocktail.in in 2012. She had a great love for fashion and photography. Interestingly, this blog is hosted at Blogger.com – a platform only beginners use. The blog focuses on fashion, beauty and lifestyle contents. Chandana Munipalle, a girl from Hyderabad, created this blog in 2010. The blog was started as a hobby blog that would have her thoughts and musings. She completed her MBA in finance after getting an engineering degree. Still, she gave preference to her love for traveling and lifestyle while starting this blog. 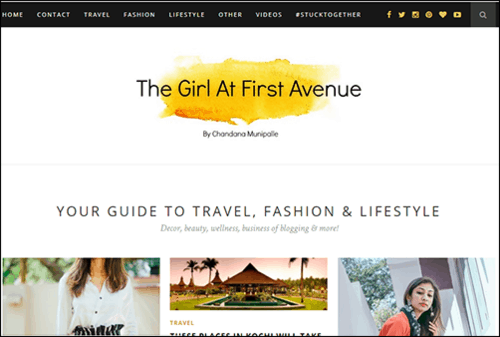 Thegirlatfirstavenue.com features travel experiences and fashion for men & women. In this post, we have seen that lifestyle blogs cover various aspects of a lifestyle. They are fashion, style, health and fitness, travel, photography, etc. Invariably all the bloggers are very active on social media. Moreover, all of them have a great following on Instagram. And they use it for brand/product promotions. Another common thing discovered was – they have similar sources of income. Most of them use advertisement, brand collaboration, sponsored post, and affiliate marketing. A part-time lifestyle blogger who devotes three to four hours a day can earn INR 15,000 to 20,000 per month. Whereas a full-time blogger can make more than INR 50,000 per month. Some professional bloggers are earning even four to five lakhs or more per month. In all, if you have a passion for fashion and lifestyle niche, you can start your blog and earn a living from it.